From thick platforms heels to velvet jackets and neon high knee socks, Marc Jacob’s spring collection totally left me speechless! I loved every detail of it and watching the runway show was totally worth it. The model’s hair were just too cool. This hair’s style was really the perfect mix to the colour of the runway. It gave a gothic and punk look to the models rocking the runway. Most of the time, model’s hair are super well done but dreadlocks are definitely a touch a few designers think about. Jacobs knows how to mix the chic outfits with the more sporty ones, as you can see above, the white dress the model is wearing is covered in laced and fancy beads and fringes but right under, the dress is more bohemian, hippie and casual. All the prints Jacobs put into his collection totally reflect this upcoming spring and I am so looking forward to wearing a yellow skirt like just like in the first picture! If you want to see more fashion posts, make sure to check the website out for more! 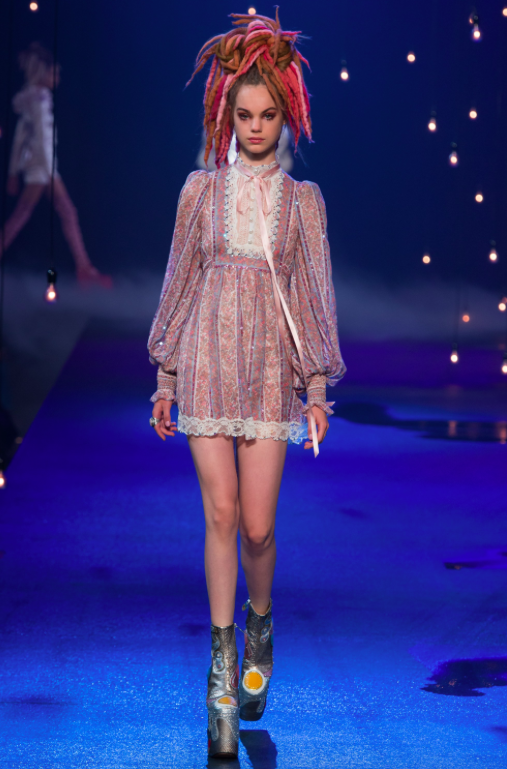 Have you watched the Marc Jacobs runway? If not, check it out.